Wildfires can occur anywhere and can destroy homes, businesses, infrastructure, natural resources, and agriculture. For more information, download the How to Prepare for a Wildfire guide, which provides the basics of wildfires, explains how to protect yourself and your property, and details the steps to take now so that you can act quickly when you, your home, or your business is in danger. WHAT: A wildfire is an unplanned, unwanted fire burning in a natural area, such as a forest, grassland, or prairie. As building development expands into these areas, homes and businesses may be situated in or near areas susceptible to wildfires. This is called the wildland urban interface. 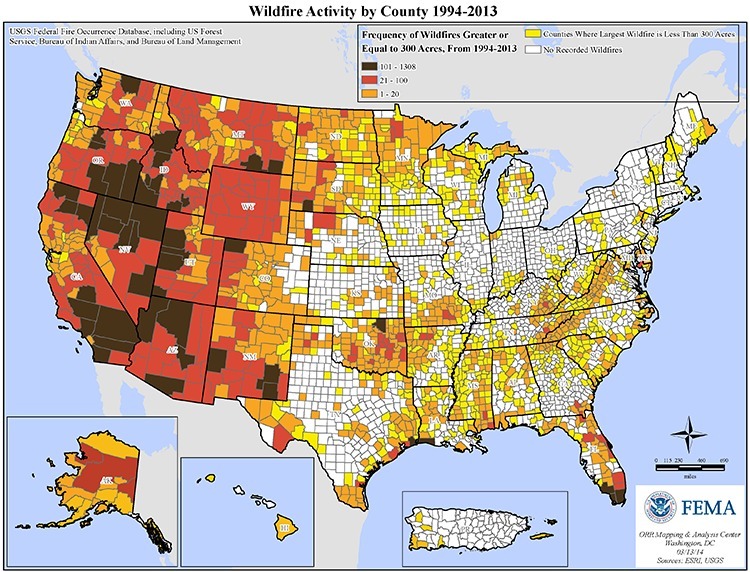 WHERE: Wildfires can occur anywhere in the country. They can start in remote wilderness areas, in national parks, or even in your back yard. Wildfires can start from natural causes, such as lightning, but most are caused by humans, either accidentally—from cigarettes, campfires, or outdoor burning—or intentionally. Do you want to have a better understanding of the wildfire risk you and your community face? Below is a map of the United States and the frequency of wildfires greater or equal to 300 acres in your county since 1994.